NAIROBI, Kenya — For decades Africa was eager for a new narrative, and in recent years it got a snappy one. The Economist published a cover story titled “Africa Rising.” A Texas business school professor published a book called “Africa Rising.” And in 2011, The Wall Street Journal ran a series of articles about economic growth on the continent, and guess what that series was called? The rise seemed obvious: You could simply stroll around Nairobi, Kenya’s capital, or many other African capitals, and behold new shopping malls, new hotels, new solar-powered streetlights, sometimes even new Domino’s pizzerias, all buoyed by what appeared to be high economic growth rates sweeping the continent. For so long Africa had been associated with despair and doom, and now the quality of life for many Africans was improving. Hundreds of thousands of Rwandans were getting clean water for the first time. 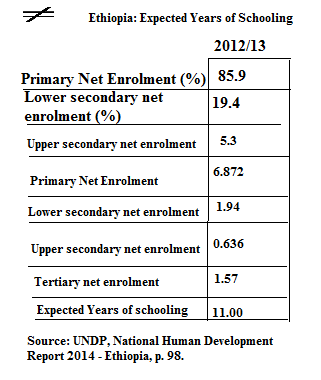 In Kenya, enrollment in public universities more than doubled from 2007 to 2012. In many countries, life expectancy was increasing, infant mortality decreasing. But in recent months, as turmoil has spread across the continent, and the red-hot economic growth has cooled, this optimistic narrative has taken a hit. Some analysts are now questioning how profound the growth actually was. “Nothing has changed on the governance front, nothing has changed structurally,” said Grieve Chelwa, a Zambian economist who is a postdoctoral fellow at Harvard. No place exposes the cracks in the “Africa rising” narrative better than Ethiopia, which had been one of the fastest risers. Ethiopia is now in flames. Hundreds have been killed during protests that have convulsed the country. The government, whose stranglehold on the country is so complete that not a single opposition politician sits in the 547-seat Parliament, recently took the drastic step of imposing a state of emergency. Many of the Ethiopia’s new engines of growth — sugar factories, textile mills, foreign-owned flower farms — now lie in ashes, burned down in a fury of anti-government rage. At the same time, a report by the McKinsey Global Institute, an arm of the consulting firm McKinsey & Company, just listed Ethiopia as the fastest growing economy on the continent from 2010 to 2015. The Democratic Republic of Congo, which is also rapidly sliding toward chaos — again, was second. Political turmoil on the one hand, rosy economic prospects on the other. Can both be true? “It comes down to how sustained the turmoil is,” said Acha Leke, a senior partner at McKinsey. In Ethiopia’s case, the unrest appears to be just beginning. Videos show demonstrations of hundreds of thousands of Ethiopians chanting antigovernment slogans, giving a sense of the depth of discontent. The protesters hail from Ethiopia’s two largest ethnic groups, a population of more than 60 million, leading many analysts to predict that this is no passing fad. Police fired on antigovernment demonstrators at a religious festival in Bishoftu earlier this month, triggering a stampede that killed more than 50 people. It seems the continent as a whole is heading into a tough period. Nigeria, Africa’s most populous country, faces its gravest economic crisis in years because of low oil prices. At the same time, it is trying to fight off Boko Haram, one of the most bloodthirsty insurgent groups on the planet. South Africa, the continent’s most developed nation, has been wracked by waves of unrest. Troops with assault rifles stomp around college campuses, trying to quell student protests. The country’s currency, the rand, hovers near a record low. South Sudan, which topped The Economist’s list in 2013 of the world’s fastest-growing economies, is now a killing field, the site of one of Africa’s worst civil wars. Still, he says, there have been fundamental — and positive — changes on the continent, like increases in disposable income for many African consumers. Mr. Chelwa, the Zambian economist, has a different view. The fundamentals of African economies have not changed nearly as much as the “Africa rising” narrative implied, he said, with Africa still relying too heavily on the export of raw materials and not enough on industry. “In Zambia, we import pencils,” he said. He also points out that some of the fastest-growing economies, like Ethiopia, Angola and Rwanda, are among the most repressive. These governments can move ahead with big infrastructure projects that help drive growth, but at the same time, they leave out many people, creating dangerous resentments. In Ethiopia, that resentment seems to be growing by the day. 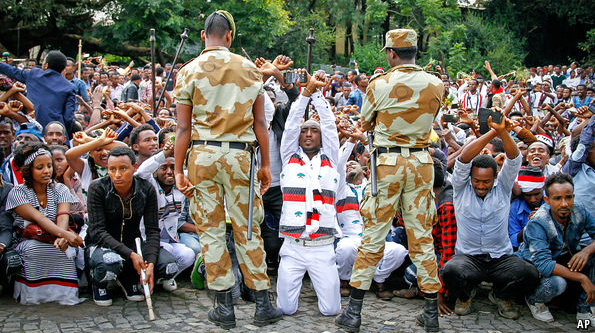 The trouble started last year when members of Ethiopia’s largest ethnic group, the Oromo, began protesting government land policies. Soon Ethiopia’s second largest ethnic group, the Amhara, joined in, and the protests have now hardened into calls to overthrow the government, which is led by a small ethnic minority. If you track the news coming out of Ethiopia, you would not be a fool to think it is two totally different countries. One day, there is a triumphant picture of a new electric train, with Chinese conductors standing next to shiny carriages (China remains a huge investor in Ethiopia.) The next, there are grisly images of dead bodies that witnesses said were people gunned down by police. Several witnesses said the security forces might be beginning to split, with some officers taking off their uniforms and joining the protests. The most recent economic data shows Africa’s growth slowing because of political instability and a global slump in commodity prices. Morten Jerven, a Norwegian economic historian who has studied statistics from across Africa, argues that the growth was never as robust as had been believed. He said that the economic indicators for many African economies in the 1990s and early 2000s were inaccurate, and that the economic progress in the last five to 10 years that appeared to have been sudden was, in fact, gradual. In other cases, Mr. Jerven said, African governments made bold economic assumptions or simply used fake numbers to make themselves look good. “The narrative had been too rosy,” he said. Africa Yearning or Africa Struggling might be a more apt characterization, but neither of these is especially new. Whatever narrative emerges should include what Mr. Chelwa calls the continent’s “ghastly inequality,” and the sharp increase in the number of people who are now better equipped with technology and information and are demanding more from their governments. Of course, it is difficult to apply a sweeping narrative to all 54 countries in Africa, where analysts agree that the picture is mixed. For instance, Rwanda remains stable with new businesses and floods of tourists while its neighbor, Burundi, teeters on the edge of chaos. Some of the same economic factors that investors cite as grounds for optimism, like Africa’s growing cities, cut both ways. According to Mr. Jerven, rapid urbanization in Africa often leads to sprawling slums, low wages and legions of disenfranchised youth. “All the economic variables for turmoil are there,” he said. Posted by OromianEconomist in Africa, Youth Unemployment. Sub-Saharan Africa is experiencing a learning crisis: While more children are attending school, many learn very little. By grade 3, many students cannot recognize a single word of a simple paragraph. At the end of the primary cycle, results from an assessment of math skills in 14 Southern and Eastern African countries found that 60% did not get beyond the designation of “basic numeracy,” and arecent assessment in 10 Western and Central (francophone) African countries found that 60% did not get beyond the ability to answer brief questions by calling upon factual knowledge or a specific procedure (defined by the authors as the “sufficient” competency threshold). By addressing these urgent education issues, governments could ensure that young Africans have the basic skills to build on through further education or on-the-job experience. Other dimensions of human capital merit action. Governments should put in place programs that ensure early child development; young children who start off with appropriate nutrition and stimulation have greater success later in life. Also, employers demand workers with high levels of socioemotional skills, which are also rewarded in household enterprises. There should be attention to developing these skills; for example, “life skills” training for adolescent girls has resulted in higher earnings. Just under two years ago, I—along with a team from across the World Bank—co-authored a report, Youth Employment in Sub-Saharan Africa, which tackled the growing gap between the aspirations of African youth and the realities of the job markets—and what governments should do about it. With an expected 11 million young Africans entering the labor market every year well into the next decade, the findings and main messages of the report remain relevant. Africa’s impressive economic growth over the past 15 years (about 7% a year) was not associated with large-scale job creation or poverty reduction. Much of this growth was in the extractive industries that are less labor-intensive. Although the formal wage sector grew quickly in some countries (10% a year in Ghana) even in the best-case scenario, this sector will not create enough jobs in the near future. The report featured estimates of what kinds of jobs workers would have in 2020 based on optimisticprojections of overall economic growth, andhigh estimates of the formal sector wage job creation that would be associated with that growth—using the cases of countries such as Bangladesh and Vietnam as sources (Fox et al. 2013). The results were sobering: while the number of jobs created would be impressive, the structure of the labor force would remain remarkably similar to what it is today—low-income African countries would have close to 60% of workers in agriculture, 20% in household enterprises, 13% working for wages in the services sector, and only 6% working for wages in the industrial sector. Demography and the difference between stocks and flows mean that any change will take a long time. Ensure that youth have solid foundational skills. Sub-Saharan Africa is experiencing a learning crisis: While more children are attending school, many learn very little. By grade 3, many students cannot recognize a single word of a simple paragraph. At the end of the primary cycle, results from an assessment of math skills in 14 Southern and Eastern African countries found that 60% did not get beyond the designation of “basic numeracy,” and arecent assessment in 10 Western and Central (francophone) African countries found that 60% did not get beyond the ability to answer brief questions by calling upon factual knowledge or a specific procedure (defined by the authors as the “sufficient” competency threshold). By addressing these urgent education issues, governments could ensure that young Africans have the basic skills to build on through further education or on-the-job experience. Other dimensions of human capital merit action. Governments should put in place programs that ensure early child development; young children who start off with appropriate nutrition and stimulation have greater success later in life. Also, employers demand workers with high levels of socioemotional skills, which are also rewarded in household enterprises. There should be attention to developing these skills; for example, “life skills” training for adolescent girls has resulted in higher earnings. Promote the dynamic private market for vocational education and training(which includes apprenticeships). Priorities include providing information and facilitating access to existing training for disadvantaged youths as well as well as ensuring the availability of better training options (this does not necessarily mean providing these services). In the presence of active training markets, public interventions need to be selective, performance driven, and evidence-based. One interesting finding is that programs that combine training with access to finance (to start or invest in a business) seem to show substantial promise. More than 70 people have been killed and dozens wounded in an ongoing crackdown on peaceful protesters in Oromia. One of the underlying causes of the prevailing tense political situation is Ethiopia’s bogus claim about “miraculous” economic growth in the last decade. The youth is not benefitting from the country’s supposed growth and doesn’t anticipate the fulfillment of those promises given the pervasive nepotism and crony capitalism that underpins Ethiopia’s developmentalism. Stripped of the accompanying jargon and undue sophistication, Zenawi was simply saying that he had abandoned the democratic route but would seek legitimacy through economic development guided by a strong hand of the state. This was a ploy, the last ditch attempt to extend EPRDF’s rule indefinitely. Using fabricated economic data to seek legitimacy and attract foreign direct investments, the regime then advanced narratives about its double-digit economic growth, described with such catchphrases as Ethiopia rising, the fastest growing economy in the world and African lioness. The claims that EPRDF has delivered economic growth at miraculous scales has always been reported with a reminder that it takes several decades to build democratic governance. The underlining assumption was that, as long as they deliver economic growth, Ethiopia’s leaders could be excused on the lack of democracy and human rights abuses associated with the need for government intervention in the economy. 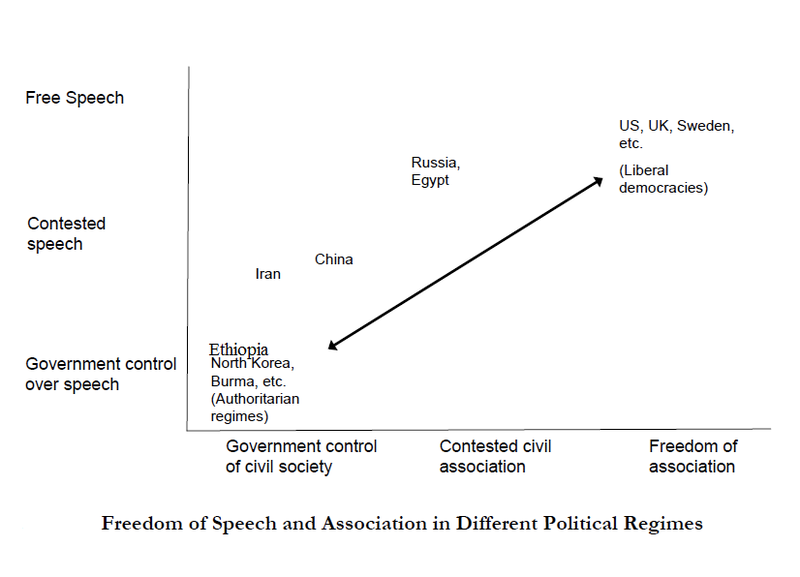 EPRDF spent millions to retain the services of expensive and well-connected Western lobbying firms to promote this narrative and create a positive image of the country. These investments were also accompanied with a tight grip on the local media, including depriving foreign reporters’ access if they cross the government line. Ethiopia’s communication apparatus was so successful that even serious reporters and analysts started to accept and promote EPRDF’s narrative on rapid economic growth. However, a few recent events have tested the truthfulness of Ethiopia’s economic rise. Drought and the resulting famine remain the Achilles heels of the EPRDF government. The government can manipulate data on any other sector, including the aggregate Gross Domestic Product, and get away with it, but agriculture is a tricky sector whose output is not so easy to lie about. The proof lies in the availability of food in the market, providing the absolute minimum subsistence for the rural and urban population. The sudden translation of drought into famine raises serious questions. For example, it is proving difficult to reconcile the country’s double-digit economic growth with the fact that about 15 million Ethiopians are currently in need of emergency food aid. The tacit understanding in using GDP as a measure of economic growth is that responsible governments generate such data by applying viable international standards and subjecting the data to scrutiny and consistency checks. Unfortunately, these standards are not foolproof; irresponsible governments with mischievous motives can abuse them. There is credible evidence that shows Ethiopian authorities deliberately inflated economic statistics to promote feel-good, success stories. Let’s take the agricultural data, which is timely and topical given the ongoing famine. This came to light recently as the European Union tried to understand anomalies in Ethiopia’s grain market, particularly persistent food inflation which the EU found incompatible with the agricultural output reported by the Central Statistical Authority (CSA) of Ethiopia. The EU’s Joint Research Centre (JRC) then developed the technical specification for studying the scope of the Cereal Availability Study in order to account for the developments in the Ethiopian cereal markets. The International Food Policy Research Institute (IFPRI) was selected to carry out the study. Figure 1 (above) compares the EU-sponsored survey and the Ethiopian government’s survey produced by the CSA. I am using the data for 2007/08 for comparison. 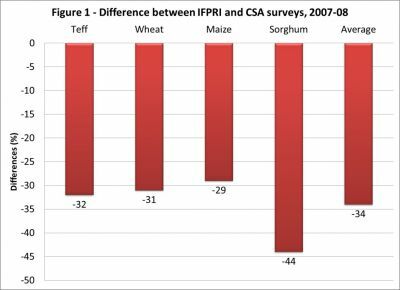 The negative numbers indicate that the IFPRI estimates were consistently lower than the CSA data. For instance, CSA overstated cereal production by 34 percent on average. This ranged from 29 percent for maize to 44 percent for sorghum. The actual amount of Teff produced is lower by a third of what’s reported by the CSA. The research team sought to explain this “puzzle” by examining the sources of the confusion, the methodological flaws that might have led CSA to generate such exaggerated economic data. Toward that end, they compared CSA’s crop yield estimates with comparable data from three neighboring countries: Kenya, Tanzania, and Uganda (see Figure 2). From 2000 to 2007, the average increase in cereal yield for these countries, including Ethiopia, was 19 percent. Yet the CSA reported a whopping 66 percent for Ethiopia’s yield growth. The country was not experiencing an agricultural revolution to justify such phenomenal growth. 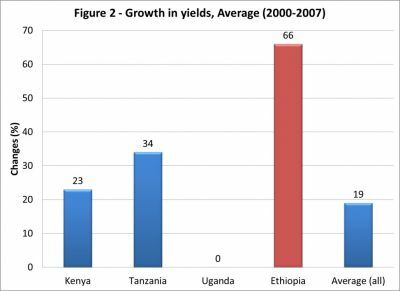 It is unrealistic that Ethiopia’s yield growth would be greater than the neighboring East African countries, particularly Kenya, where the agricultural sector is at a much more advanced stage. If anything, the reality in Ethiopia is closer to Uganda, which did not report any yield increase during that period. This reveals the extents of data manipulation by Ethiopian authorities to create an inexistent economic success story and seeks political legitimacy using a bogus record. We now know the widespread distortions in official statistics on cereal production thanks, in no small part, to EU’s intervention in sponsoring a study and explaining the disparities. Cereals represent only a sub-sector in the agricultural realm. 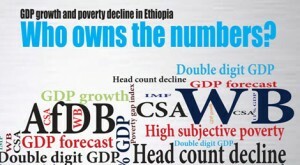 It is likely that worse distortions would be revealed if similar studies were done on Ethiopia’s growth statistics in other sectors, including manufacturing and service divisions. The IMF has praised Ethiopia for achieving accelerated growth with a focus on equity and poverty reduction, a challenging dilemma for most countries. However, a closer look at three interconnected facts turns this claim on its head. First, as noted above, Ethiopia’s agricultural output has been inflated by 34 percent on average. Second, a33 percent poverty reduction since 2000 is widely reported. 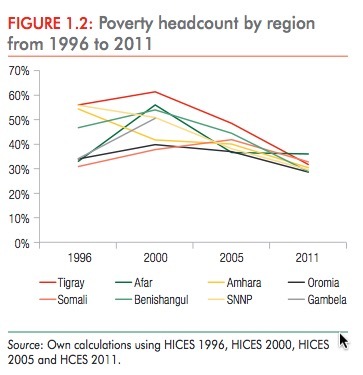 Third, there is a consensus that poverty reduction has happened mostly in rural Ethiopia. Now we put these three facts together and apply a simple logic to establish that the 33 percent poverty reduction is explained by the 34 percent exaggerated agricultural outputs. Notice that it is not by accident that the two percentage points are almost identical. Therefore, the ups and downs cancel each other out. In the best-case scenario, poverty rate must remain at the same level as in 2000. The World Bank, IMF and other donors have often anchored their conclusions on poverty reduction on alleged changes in the agricultural sector, where the bulk of the poor live and work. Little do they know that the data they used to compute the poverty index comes from agricultural statistics with hugely inflated yield assumptions as shown above. This raises the question: where has the billions of dollars in bilateral and multilateral aid pumped into Ethiopia in the name of poverty reduction and the millennium development goals gone? The ‘Ethiopia rising’ storyline is a standard set by foreign correspondents who often repurpose official government press releases, or reports based on the construction projects in the capital, Addis Ababa. For example, Bloomberg Africa’s William Davison, often uses the proliferating high-rise buildings in Addis Ababa as tangible evidence of Ethiopia’s double-digit economic growth. In his latest whitewash, Davison writes, “such growth is already visible in parts of the capital, where shopping malls and luxury hotels are sprouting up.” That a veteran reporter for a business website unashamedly passes judgment on economic success by referring to heights and width of buildings underscores his shallow understanding of the country’s social and political fabric. Here are some of the questions that reporters aren’t asking and seeking answers for: Who owns those building? Where did the investment money come from? Are there any firm linkages between these physical infrastructures and the rest of the Ethiopian economy? I have partially answered some of these questions in a previous piece and will soon provide additional insights. For now, I would like to draw attention to the existence of an “enclave economy” within the mainstream Ethiopian economy. This enclave is made up of highly interconnected crony businesses, which are owned and operated by Tigrean elites, who also have a tight grip on the political and military command structures. Take, for example, the Endowment Fund for Rehabilitation of Tigray (EFFORT), a business conglomerate affiliated with the Tigrean People’s Liberation Front (TPLF). 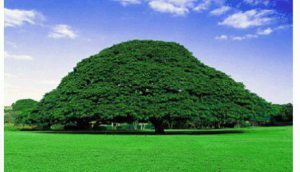 EFFORT has its humble origin in the relief and rehabilitation arm of the TPLF. 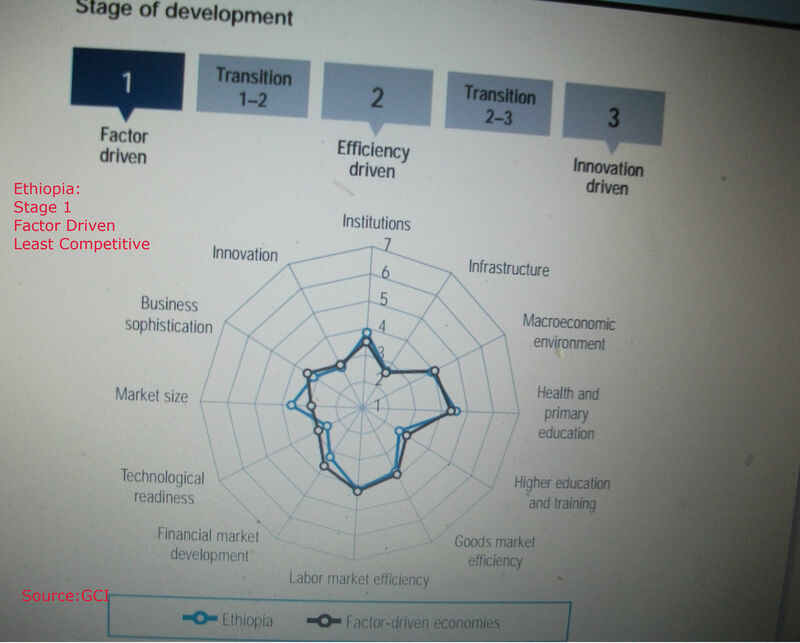 However, it has undergone amorphous growth and now controls the commanding heights of the Ethiopian economy. By some estimates, EFFORT now controls more than 66 business entities. The EFFORT controlled enclave and related military engineering complexes have created a semi-autonomous economy in Ethiopia. They made smart choices and specialized in engineering and construction businesses. This means they do not have to rely on the Ethiopian public for their products; instead, each specialize in separate industrial branches and buy from each other and also sell to the government, which is also in their hand. The huge government infrastructural projects necessitated by the “developmental state” model create business opportunities for these engineering companies. The enclave economy is only loosely linked to the mainstream economy and it does not benefit the bulk of the Ethiopian people in any meaningful way. The luxury hotels and supermarkets that Davison refers to cater for the needs of the affluent business classes, their families, and the expatriate community. In other words, Ethiopia’s miraculous economic growth, if it in fact exists, must have happened only in the enclave economy. Statistically, it is possible to generate a double-digit economic growth at the national level through a combination of some real astronomical growth in the enclave component and stagnation or declines hidden, through some accounting tricks, in the rest of the economy. The ensuing famine has shaken the foundation of Ethiopia’s growth narrative, yet western NGOs and media outlets appear to suffer from the lock-in effect in adopting consistent storylines. They continue to link and refer to the World Bank, IMF and others reports and indexes by multilateral organizations. That’s why we continue to see comical headlines such as “Ethiopian Drought Threatens Growth as Cattle Die, Crops Fail,” which assumes that Ethiopia’s growth is actually occurring. This acquiescence does not only display ignorance, but it also underscores an effort to evade accountability for previous mistakes and failure to report accurate information. Over the past 25 years, the EPRDF worked tirelessly to create a distorted image of the country and began craving and lobbying foreigners for praises. Enron’s success involved an elaborate scam, but the firm was named “America’s Most Innovative Company” for six consecutive years. This fame did not stop Enron from crumbling. EPRDF’s fate will not be any different. The Oromo uprising has already started the unraveling of its elaborate scams devised to attain legitimacy on the back of non-existent economic and democratic advancement. J. Bonsa is a researcher based in Asia. This article was first published on OPride. 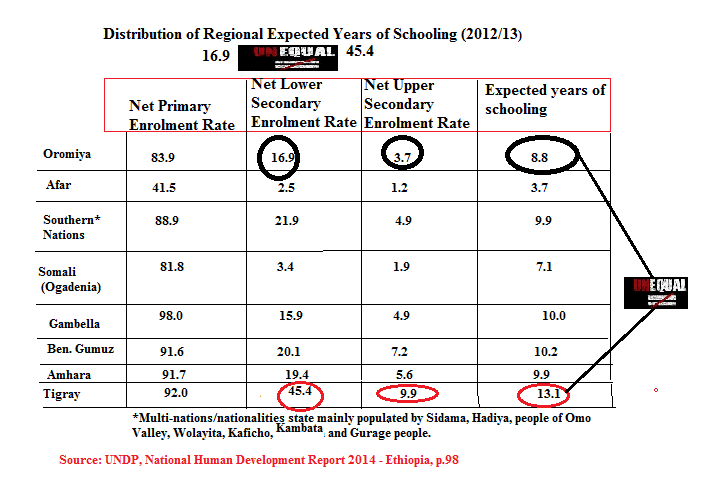 Posted by OromianEconomist in Free development vs authoritarian model, Poverty, Youth Unemployment. Africa is now home to more than 160,000 people with personal fortunes worth in excess of $1m (£642,000), a twofold increase in the number of wealthy individuals since the turn of the century that highlights the problem of deepening inequality as some of the world’s poorest nations register strong economic growth. The combined wealth holdings of high-net-worth individuals – those with net assets of $1m or more – in Africa totalled $660bn at the end of 2014, according to a report by New World Wealth, a South African market research firm. 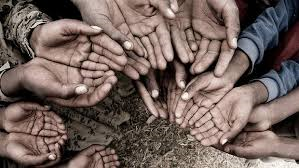 Meanwhile, the number of poor people in Africa – defined as those living on less than $1.25 a day – increased from 411.3 million in 2010 to 415.8 millon in 2011,World Bank data shows. By 2024, the number of African millionaires is expected to rise 45%, to approximately 234,000, according to the report. During the past 14 years, the number of high-net-worth individuals in Africa has grown by 145%. The rate for the Middle East over the same period was 136%, while in Latin America it was 278%. The global average was 73%. The report said that by the end of 2014, the number of people worldwide worth more than $1m had reached 13 million with a combined worth of $66tn, although the number of millionaires can vary depending on what assets are included anddifferent methods have produced different figures. New World Wealth, for example, do not include primary residences when assessing wealth or net assets. The World Bank has forecast an average of 5.5% economic growth for sub-Saharan Africa over the next year, though it warned that “extreme poverty remains high across the region”. Nick Dearden, director of the advocacy group Global Justice Now, said the report shows deepening inequality across the continent. “It’s no wonder that rich individuals in Africa are getting richer, because we’re seeing a form of ‘development’ … which hugely benefits the wealthy but makes the lives of the poor even harder. Aid money, trade agreements and corporate ‘investment’ pushed by Britain are locking countries into a form of growth which is all about making the rich even more rich and the poor even more poor.” Mauritius has the wealthiest individuals in Africa, with average per-capita wealth of $21,470, according to the report. The rankings show that people in theDemocratic Republic of the Congo are the poorest, at $230 a person. To put Africa’s wealth into context: the global average wealth per capita is $27,600, with top-ranking countries such as Switzerland and Australia boasting per-capita wealth of more than $200,000. “Over the last year there’s been very strong growth in places like Mozambique, Zambia and Tanzania. Going forward, we expect Mozambique to continue to be the fastest growing market for high-net-worth individuals in percentage growth terms. So I’d say that Mozambique stands out in this report,” said Andrew Amoils, head of research at New World Wealth. Angola, where per-capita wealth rose from $620 a person in 2000 to $3,920 in 2014, recorded the highest growth over the 14-year period analysed. In Zimbabwe, the worst performing country, wealth per capita dropped from $630 a person in 2000 to $550 a person in 2014. Zimbabweans have until September to turn in theirZimbabwean dollars before the currency is discarded. The southern African country was one of the wealthiest countries in sub-Saharan Africa on a wealth-per-capita basis, said the report’s authors, but the country is now bottom of the rankings. They also note that while other low-ranked countries on the list such as Libya and Tunisia have been affected by uprisings and political instability, Zimbabweremains under the same leadership. The study identifies erosion of ownership rights in Zimbabwe, ongoing political intimidation, election fixing and investor confusion arising from the banning of the independent media in the early 2000s as key reasons for the country’s poor performance. South Africa is home to the highest number of millionaires on the continent at 46,800 in 2014. Egypt comes in second with more than 20,000, followed by Nigeria in third place. Angola: 41% in oil and gas, 13% in financial services, 12% in real estate and construction, 8% in basic materials, 6% in transport. Ghana: 24% in financial services, 16% in real estate and construction, 13% in fast-moving consumer goods, 10% in basic materials, 7% in retail. 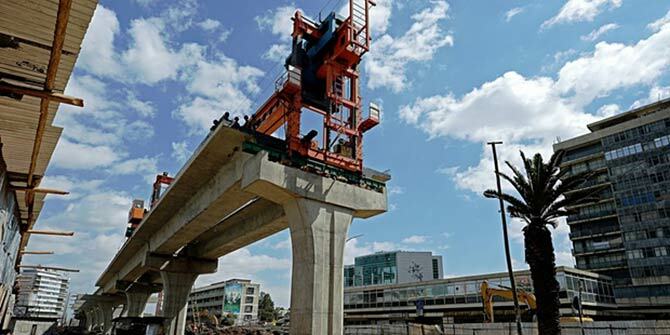 Kenya: 19% in real estate and construction, 18% in financial services, 10% in manufacturing. South Africa: 20% in financial services, 16% in real estate and construction, 14% in basic materials, 8% retail. Nigeria: 24% oil & gas, 16% basic materials, 13% transport, 10% financial services. Zambia: 22% in basic materials, 16% real estate and construction, 12% financial services, 9% transport. Posted by OromianEconomist in Africa Rising. Posted by OromianEconomist in Africa, Development, Development & Change, Namibia, Theory of Development. Posted by OromianEconomist in Africa, Africa Rising, African Poor. Over the last few years, sub-Saharan countries have seen significant economic growth. Seven of the ten fastest growing economies in the world between 2011-2015 come from Africa. But this economic growth has not quite translated into significant poverty reduction. As analysts point out, the number of people on the continent living under $1.25 a day has risen from 358 million in 1996 to 415 million in 2011. Tanzania for example, which saw an average of 6% GDP growth over the last several years, has grappled with this disconnect. “At the macro-level, we may be doing well, but it does not touch the unemployed or those involved in the informal economy,” a former cabinet minister told Quartz. However, the latest data from the Pew Research Centre shows that there has been significant poverty reduction in some African countries. The reduction of poverty and increase in the ranks of the slightly better-off “low-income” category is good news, but the challenge remains that many African countries have not been able to transition people into the middle class. (Gulf News, NEW YORK, 10 July 2015): The dramatic lurch of hundreds of millions of people from poverty since the millennium began has not resulted in a truly global middle class, a new report says. Instead, the improvement in living conditions for almost 700 million people has been a step forward from the desperate existence of $2 or less a day into a low-income world of living on $2 to $10 daily, the Pew Research Center says. Its report, released Wednesday, looks at changes in income for more than 110 countries between 2001 and 2011, the latest that data for such a large range of countries was available. The report comes just two days after the United Nations announced success in key development goals adopted by world leaders at the start of the millennium, including the lifting of more than one billion people out of extreme poverty. More than half of the world’s middle-class population was living in the Asia and South Pacific region by 2011. That’s a jump from 31 per cent to 51 per cent in a decade. Largely because of Asia, the report says the world’s middle-income population nearly doubled over that time, from 399 million to 784 million. But the gains are hardly seen everywhere. The report shows that while commodity-rich South America and a strengthening Eastern Europe, including Russia, also made strides into the middle class, Africa, India and many parts of Asia have yet to do the same. The poverty rate for India, Asia’s other population giant, fell from 35 per cent to 20 per cent over the report’s period, but its middle class only grew from 1 per cent to 3 per cent. The report notes that India’s economic reforms began in 1991, 13 years after China, though the scope and pace of the countries’ reforms have varied. South America almost reached the point where half of its population is at or above middle-income, at 47 per cent. And despite China’s rise, more than three-fourths of its people were still poor or low-income. The only other countries seeing a significant shift into the middle class, where the poverty rate fell by at least 15 per cent and the middle-income population grew by at least 10 per cent, were Bhutan, Moldova, Ecuador, Argentina and Kazakhstan. Among countries with a large number of high-income people, or those living on more than $50 a day, the United States stood out from its Western peers by slipping as its economy stalled. Its high-income population actually edged down, from 58 per cent in 2001 to 56 per cent in 2011. Factors like conflict and falling oil prices likely have affected the findings for some economies, such as Russia’s, in the past few years, the report notes. Posted by OromianEconomist in Africa, Corruption in Africa, Dictatorship. The greatest crisis facing Africa is a leadership crisis in all areas of people activity.In terms of natural resources, Africa is the world’s richest continent. It has 50% of the world’s gold, most of the world’s diamonds and chromium, 90% of the cobalt, 40% of the world’s potential hydroelectric power, 65% of the manganese, millions of acres of untilled farmland, as well as other natural resources. Yet, despite this vast resource the bulk of African people live as if they were citzens of deserts. Despite being home to millions of skilled and talented innovators, African leadership struggles to stimulate and retain it strongest resource — the people: They either live in unnecessary frustration, hopelessness and poverty, die of preventable disease, or run to the West to gain appreciation. 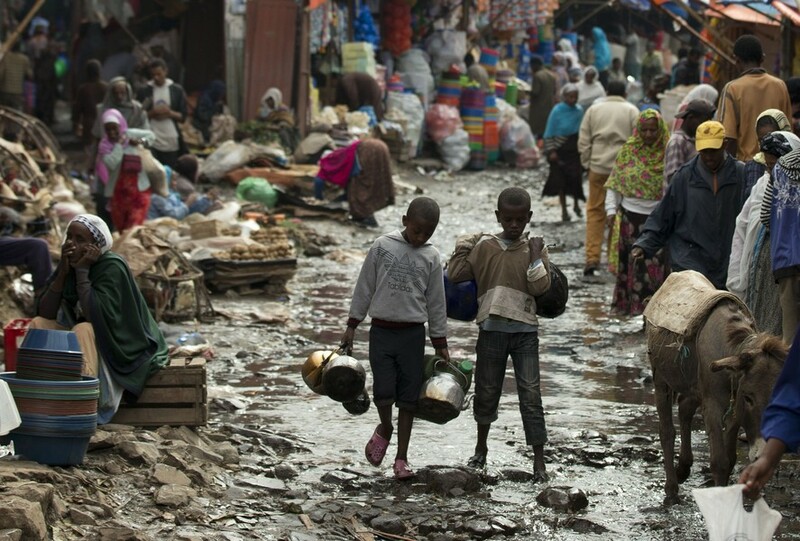 The greatest crisis in Africa is not due to HIV, religion, or famine, or even war. Because all of those things are tied to leadership in some capacity. The failure to produce an African brand from the billions of tons of raw material Africa exports to the West, is primarily due to the Faustian, myopic, selfish, backward type of non-progressive leaders who are planted as candidates in post-colonial empires. Top traits are either naive, vision-less, proxy implants, opportunistic/parasitic and totally compromised. 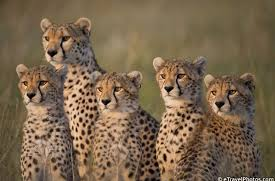 “The Cheetah Generation refers to the new and angry generation of young African graduates and professionals, who look at African issues and problems from a totally different and unique perspective. They are dynamic, intellectually agile, and pragmatic. They may be the ‘restless generation’ but they are Africa’s new hope. They understand and stress transparency, accountability, human rights, and good governance. They also know that many of their current leaders are hopelessly corrupt and that their governments are contumaciously dysfunctional and commit flagitious human rights violations.” George Ayittey, the distingushed Ghanaian economist. TALL ORDER: An extra 450 million jobs need to be created in the next 20 years to match expansion in the number of working-age people in the region. Young people without opportunities are getting angry all over Africa – and there are hundreds of millions of them. (Photo/AFP). PROTESTS from Burkina Faso to Burundi have been sparked by youthful populations with little hope of employment and by leaders who have in some cases ruled for decades. The discontent, which began in Burkina Faso in October, spread to the Democratic Republic of Congo (DRC) in January, and has now crossed the continent to Burundi, prompting regional leaders to call an emergency meeting after two weeks of protests and at least 14 deaths. Mass demonstrations in Burkina Faso ended Blaise Compaore’s 27 years in power. While sub-Saharan Africa has grown faster than every region except developing Asia in the past 10 years, there aren’t enough jobs for the 1 billion people on the continent. An extra 450 million jobs need to be created in the next 20 years to match the expansion in the number of working-age people in the region, the International Monetary Fund said last month. About 40% of people in Africa are under 15 years old, the most of any region, according to the U.S. Census Bureau. The unemployment rate for people 15 to 25 years old living in Burundi’s capital, Bujumbura, is three times higher than the rest of the working population, according to the African Development Bank (AfDB). Rwanda President Paul Kagame has warned that the violence in neighbouring Burundi threatens stability in East Africa. Youth have led two weeks of protests to prevent President Pierre Nkurunziza from seeking a third term in office next month. The Constitutional Court approved his request, despite the opposition claiming it violates a 15-year-old peace agreement that sets a two-term limit. The nations that will likely watch closely what happens in Burundi are those with elections scheduled in the next two years, Yolande Bouka, a researcher on conflict prevention at the Institute for Security Studies in Johannesburg, said. Congo, Rwanda and Tanzania and Uganda all have polls during that period. Burundi ranks eighth-lowest on the United Nations Human Development Index, which measures indicators such as income, child mortality and education. Congo is second-to-last on the 190-member list. https://magic.piktochart.com/embed/6055699-africa-bombUsing social media like Twitter and Facebook, young activists can mobilise faster than in years gone by and can collaborate across borders. The movements in Congo and Burkina Faso draw inspiration from Senegalese artists, who began protests in 2011 against power outages. 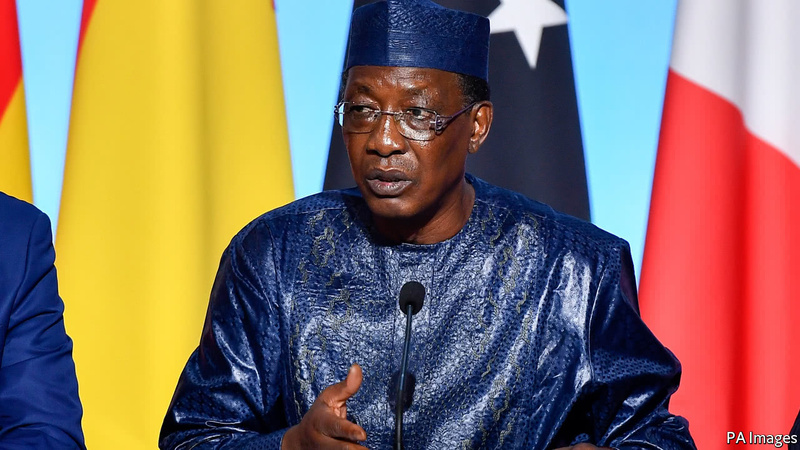 The Senegalese movement was key in mobilising youth to vote President Abdoulaye Wade, who had ruled for 12 years, out of power a year later. Demonstrations erupted in Congo in January when lawmakers tried to change electoral laws in a way that could have delayed elections. That would have extended the 14-year rule of President Joseph Kabila, who took over when his father was assassinated in 2001. Congolese activists met with artists and musicians from Senegal and Burkina Faso in March. The police arrested them in the Congolese capital and accused them of “promoting violence.” Kabila, who faced criticism from Human Rights Watch, said he will not run for office next year. While there are countries in sub-Saharan Africa with leaders who have been in power for more than three decades, including Zimbabwe, Angola and Equatorial Guinea, political opposition there says they are suppressed. Rwanda’s Kagame, who has been president since 2000, also hasn’t faced popular opposition as he says he is open to staying another term. Parliament is reviewing a petition signed by 2 million people who support changing the constitution to allow for a third term. 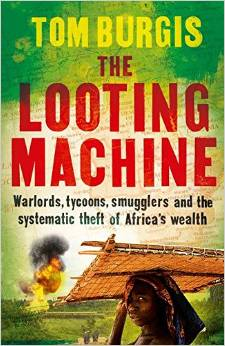 -With assistance from David Malingha Doya in Nairobi and Michael J. Kavanagh in Kinshasa. Posted by OromianEconomist in Africa Rising, Aid to Africa, Corruption in Africa, The 2014 Ibrahim Index of African Governance. Africa’s middle class: until data collection and analysis used to measure income distribution improve, the continent’s statistics are unreliable. On September 30th Kenya announced that it had revised its GDP upwards by 25%. Earlier this year Nigeria’s National Bureau of Statistics made an even bigger splash when a similar exercise showed the Nigerian economy to be 89% bigger than previously thought, displacing South Africa’s as the continent’s largest economy. In 2011 the African Development Bank (ADB) declared that not only was Africa rising, but that statistics on income distribution revealed a sizeable middle class now comprising 34% of Africa’s population—or nearly 327m people. Earlier that year, The Economist announced that IMF forecasts predicted that seven of the ten fastest-growing economies in the world over the next five years would be in Africa. 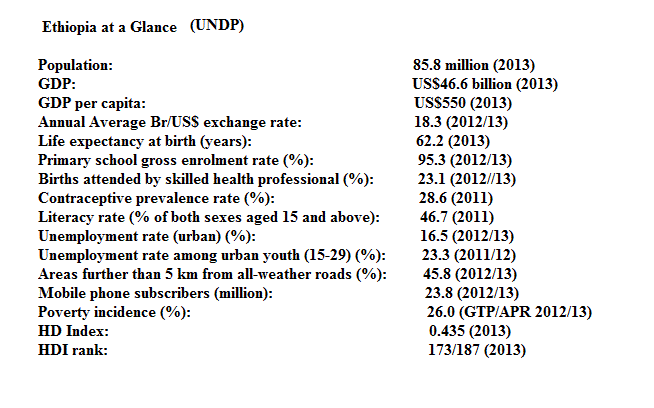 In 2010 Ghana revised its GDP by 63%. 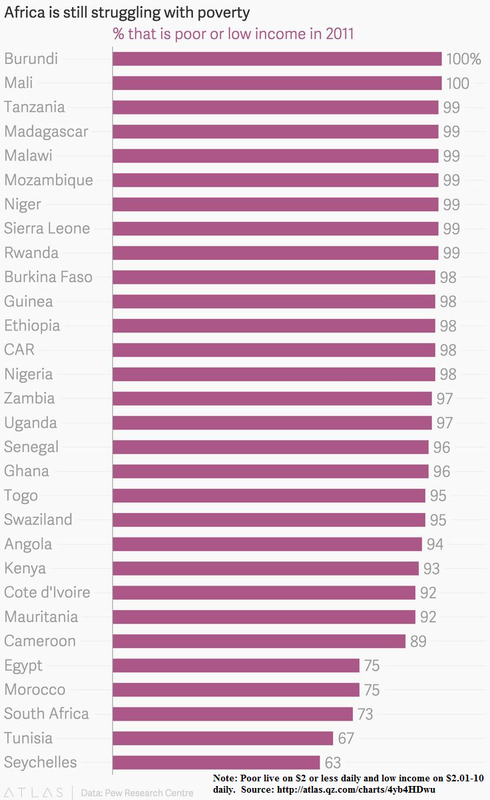 These statistical earthquakes, while good news, have shattered trust in Africa’s numbers. Shanta Devarajan, chief economist of the World Bank’s Africa region, called it “Africa’s statistical tragedy” when he reflected on the quality and availability of quantitative evidence in the aftermath of Ghana’s GDP revision. In retrospect it may seem puzzling that bewilderment has greeted what has essentially been good news – Africa’s economies and its middle class are bigger than we thought. But, for too long, we have neglected the accuracy of African economic statistics. We are only now waking up to the size of the knowledge gap because suddenly the numbers on African economies matter. Investors and social scientists rely on accurate measurements. If 327m middle-class Africans really existed, investors would consider Africa a potentially lucrative market for making deals in real estate,retail, wholesale and communications. These huge numbers would force social science scholars to redefine and jettison hackneyed development phrases such as “subsistence”, “informal economies”, “food security” and “poverty eradication”. However, the AfDB’s 2011 report conceded that about 60% of Africa’s middle class, approximately 199m people, were barely out of poverty. This startling admission was based on its expansive definition of the middle class: individuals who spend between US$2 and $20 daily. For political scientists, the middle class is the backbone of a democratic society. In Marxist theory the rise of the bourgeoisie permits progressive modernisation and industrialisation. For investment banks, multinational corporations, real estate developers and traders, the middle class is defined by purchasing power and signifies a potentially untapped market. For this reason, a more accurate definition of the middle class requires a higher purchasing-power bracket that shows that households are living beyond subsistence and that its members are also high school and university graduates. Researchers affiliated with international organisations and investment banks have also tried counting Africa’s middle class. Some surveys, such as accounting firm EY’s 2012 Africa by numbers report, dance around the actual size, and prefer instead to refer to “a growing middle class”. Similarly, The rise of the African consumer, a 2012 report from McKinsey, a consulting and research company, stays out of the numbers game altogether and never mentions the middle class. Standard Bank released a report in June assessing 11 sub-Saharan economies, or half this region’s total GDP, to measure the size of the continent’s middle class. Based on these reports, the size of Africa’s middle class stretches from as few as 15.7m households, as estimated by McKinsey, to the 327m people the AfDB assessed in 2010. Completely different monetary definitions of the middle class drive these differences. The AfDB’s bottom threshold of $2 per day is much lower than McKinsey’s $55, Standard Bank’s $23 or the $10 per day used by the OECD, a Paris-based intergovernmental think-tank. In addition, the OECD and AfDB report their statistics in total number of people, while McKinsey and Standard Bank report on households without specifying their size. It may appear puzzling that Standard Bank defines the middle class as households that spend between $8,500 and $42,000, while McKinsey’s 2010 Lions on the move report defines this group as households that spend above $20,000 a year. This can be reconciled: McKinsey includes all households above $20,000 in disposable income. This means that they also count very rich households, which explains why their estimate is higher. In its other report, The rise of the African consumer, McKinsey contends that 40% of spending-power growth will come from households that earn above $20,000 annually. They note that “this group currently accounts for just 1-2% of total households” but that this income cluster is “growing faster than the overall average, both in numbers and in average income”. So what are we left with? We went from a middle class that represents 34% of Africa’s population to one that represents 1-2%. But this tiny group is not middle class: they are very rich households that have the fastest-growing incomes. Ultimately, what we are seeing is not a pyramid bulging in the middle as in the picture drawn by the AfDB. The numbers from McKinsey and Standard Bank describe a society where the top spenders are getting richer. This may be good news for some banks and investors, but it does not carry the same connotations for social scientists. None of the above, however, explains how these numbers were calculated or whether they are trustworthy. It is highly likely that many of the GDP growth numbers exaggerate actual increases in productivity and improvements in living standards. Both Ghana’s and Nigeria’s GDP ballooned following the introduction of new benchmark years for estimating GDP in 2010 and 2014. How confident can one be about a 7% growth rate in a country likeNigeria when almost half of the economy was missing in the official baseline? Some commentators proclaim that Africa is growing faster than its outdated measurements suggest. Indeed, some countries’ economies are larger than those shown by these old numbers. But that does not mean that recent growth has been faster too. The opposite is likely. An outdated baseline means that “new” growth is more than likely “previously unrecorded” growth. When the base is too small, the proportion of economic growth will be overstated. Moreover, when statisticians and politicians know that their numbers are minimising total GDP, it is tempting to add a bit each year to pre-empt a large upwards revision when the GDP numbers are ultimately corrected. GDP growth estimates are also misleading because only parts of the economy are recorded. Changes in exports and foreign direct investment are quantifiable and easily measured, while other important sectors that may be moving less quickly, such as food production, often remain unobserved. In developed countries, like Norway, individuals’ and companies’ income, production and expenditure are reasonably well recorded and available through administrative records. The government routinely collects this information as part of its day-to-day operations. In poorer countries, few companies and even fewer individuals, households and farms record or report income, production and expenditure. 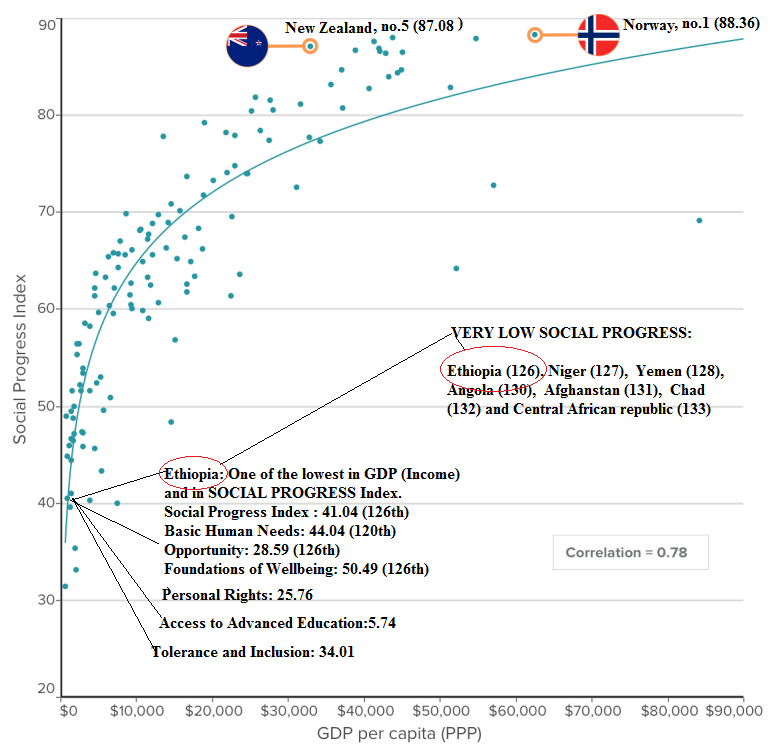 To get a measure of how income is distributed in a country and how many people earn less than $2 a day requires drawing a graph with income on the X-axis and population on the Y-axis. On such a graph the share of households that earn below $2, $3 or $4 a day can be seen, as well as the income ratio of the top 1% and bottom 10%. Drawing this graph presumes this information is reliable. In practice, however, these numbers are mostly non-existent because data collection is expensive and time consuming. 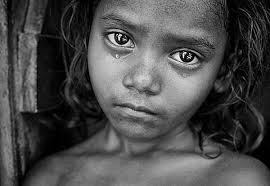 The most common audit, the Living Standards Measurement Study, is used by the World Bank to obtain poverty statistics. It requires each household to spend a day filling out a long questionnaire. A typical survey with a sample of about 2,000 households costs a few million dollars. From data collection to dissemination takes another two years. According to a May 2013 report by the Brookings Institution, a Washington, DC-based think-tank, six of sub-Saharan Africa’s 49 countries have never conducted a household survey and only 28 countries have done one in the past seven years. Surveys measuring social indicators such as health and demographics have similar gaps. Moreover, only about 60 countries in the world have vital registration systems required to monitor trends in social indicators, and none of these are in Africa, according to an article by Amanda Glassman, a senior fellow at the Washington, DC-based think-tank Center for Global Development. Any statement about the size and direction of poverty and income in the world, particularly in Africa, relies on many assumptions and extrapolations, a practice that can lead to gross inaccuracies. Reports on the size of Africa’s middle class highlight these presumptions and (mis)calculations. The Standard Bank report, which provides a conservative estimate of the size of the middle class, is based on a sample of 11 sub-Saharan African countries. The problem is that data availability is not random – it is biased because we know more about the richer economies, such as Nigeria and Ghana, than we know about poorer, more problematic countries such as the Democratic Republic of Congo, Somalia or Côte d’Ivoire. Another complication is that we do not know how Standard Bank determined middle-class growth rates for years that lack official information on income distribution, nor how it dealt with the very well-known discrepancies and incoherencies in Nigeria’s household surveys. It is undeniable that more goods are leaving and entering the African continent today than 15 years ago. But does the increase in the volume of transactions result in a sustained lift in living standards? Some might argue that a positive African narrative and the power of self-fulfilling prophecies can make the vision of a huge middle class in Africa come true. A fact-based outlook, however, is the best path. Does Africa’s population really have more spending power? Are fewer Africans hungry? The evidence on income distribution does not provide accurate answers. Everyone wants to know if the continent is better off, but proclaiming that it is without solid proof may backfire – particularly if poverty reduction and income distribution are slower and more unequal than what has been publicised. Impartial and inaccurate numbers too often lead to poor policy decisions. Posted by OromianEconomist in Africa, Africa Rising, African Poor, Aid to Africa, Corruption, Culture, Development, Dictatorship, Economics, Food Production, Human Rights, Ideas, Land Grabs in Africa, Ogaden, Omo, Oromia, Oromiyaa, Oromo, Oromo Nation, Self determination, Slavery, South Sudan, The Tyranny of Ethiopia, Tyranny, Uncategorized, Youth Unemployment. The term “Africa Rising” is on the lips of many these days particularly as seven of the world’s fastest growing economies are believed to be African. But can this current wave of Afro-optimism bring genuine prosperity to the African continent? Dr Kingsley Chiedu Moghalu, the Deputy Governor of the Central Bank of Nigeria thinks not. In his latest book, Emerging Africa: How the Global Economy’s ‘Last Frontier’ can prosper and matter, Dr Moghalu presents his own ideas on how Africa can become truly prosperous. He describes it as “a vision for Africa’s future based on a fundamental analysis of why Africa has fallen behind in the world economy”. In doing so, the LSE alumnus discusses some fundamental misunderstandings about which African states need to revise their assumptions. The first is the idea that globalisation is automatically good. Rather, Dr Moghalu describes it as a huge and influential reality which Africans must engage with a sense of sophistication and self-interest. It is important to find a way to break that stranglehold because globalisation is neither benign in its intention nor agnostic in its belief. It is driven by an agenda and there are people who drive it. Foreign aid does have its place, Dr Moghalu admits, but “it should always be within a limited time frame and it should focus on economic wealth creation activities rather than just helping people survive”. On the day we meet, the UK Secretary of State for International Development Justine Greening is in the news revealing that there will be a radical shift in future UK aid into economic development, concentrating on economic growth and jobs. Dr Moghalu expressed great pleasure at this announcement remarking that “it is very interesting that British policy is catching up with the recommendations in my book”. Another fundamental understanding that the central banker develops in his book is the importance of understanding the four different kinds of capitalism and the implications they have for Africa’s growth. The first is state capitalism which is not very common, although it is practised by China. It is, in fact, an oxymoron. Many African states do not have the capacity to run state capitalism because you need an all-knowing state with a huge reserve of strategic thinking capacity to be able to direct wealth creation for the purposes defined by the state. There is also oligarchic or crony capitalism in Russia and some African states. This can be turned into strategic activity if cronyism is not rampant. South Korea did that by creating the Chaebols, the family-held businesses which today dominate the South Korea economy. Welfare capitalism is the norm is Europe. 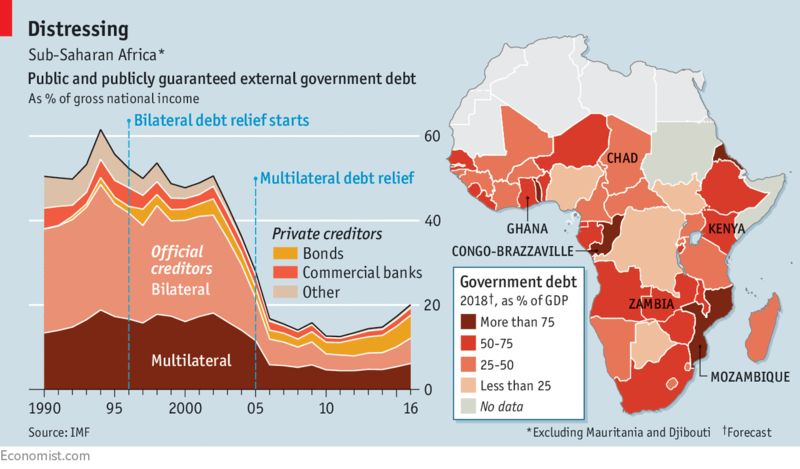 Some African states have practised welfare capitalism without generating the type of revenue that will sustain it into the future. Now it is out of favour. Entrepreneurial capitalism is what made America wealthy and this is what Dr Moghalu recommends for most African economies because it suits the African culture. Along with a certain amount of oligarchic and welfare capitalism, it would do Africa a world of good, he adds.